One of the most common questions I'm asked as a legal management consultant specializing in law firm marketing and business development is whether there's any remaining benefit to participating in the Martindale-Hubbell Law Directory. It's also one of the most common queries on the various law firm marketing discussion groups (here and here) and a common topic for legal bloggers (here and here) and journalists (here and here). My expertise in the category comes from having led the Martindale-Hubbell large law and corporate business some years ago. However, I typically remain quiet on the topic. I'm told that, as an alum, critical commentary may be discarded as some sort of sour grapes and any positive commentary may be mistaken for misplaced loyalty. The reality is, I may bring the most objective perspective of any pundit. And it's from this perpective that I suggest that we're all asking the wrong question. Law firm leaders have an unusual reliance on precedent for decision support. Invariably when assessing whether to launch or cease an activity, they will look to what other law firms are doing, particularly firms considered to be competitors or in their peer group. There's strength in numbers, so if other firms are doing X, or discontinuing Y, this provides context and cover for us to do the same. The problem with such thinking is that benchmarking works best in comparisons between similar entities, and law firms are as different as other businesses, even those in the same space. (Do you think Mercedes-Benz closely follows what Kia is up to?) Also, and not to put too fine a point on it, just because a respected competitor is doing something, or stops doing something, doesn't mean it's a smart decision. The object lesson is that mimicking dissimilar organizations in dissimilar markets and in perhaps dissimilar geographies that offer dissimilar services to dissimilar clients, is hardly an exercise in sound business management. Whether it's Martindale-Hubbell or any other directory, and there are many players in the space (here and here and here and here and here, to name just a few), the question for law firm leaders isn't whether other firms are participating or not, the question is whether our participation is an effective use of our law firm's capital. A legal directory is but one component of a law firm's marketing mix, in the same way that a bowl of sugar-coated chocolate lumps (or is it chocolate-covered sugar lumps?) is part of a balanced and nutritious breakfast. Rely on one component alone and your results may be less than desirable. In a bygone era a legal directory may have been the only marketing tactic a law firm employed outside its own native market. But today, there are countless marketing tools available, and the Internet provides potential access to countless buyers. But access to such tools doesn't always mean they're used effectively. Recall the appearance in the late '80s and early '90s of word processing and desktop publishing software programs, which provided average computer users with sophisticated tools to rival those of professional publishers. What resulted was primarily an increase in poorly-designed, barely-readable newsletters produced by anyone with typing skills. Want an example closer to home? 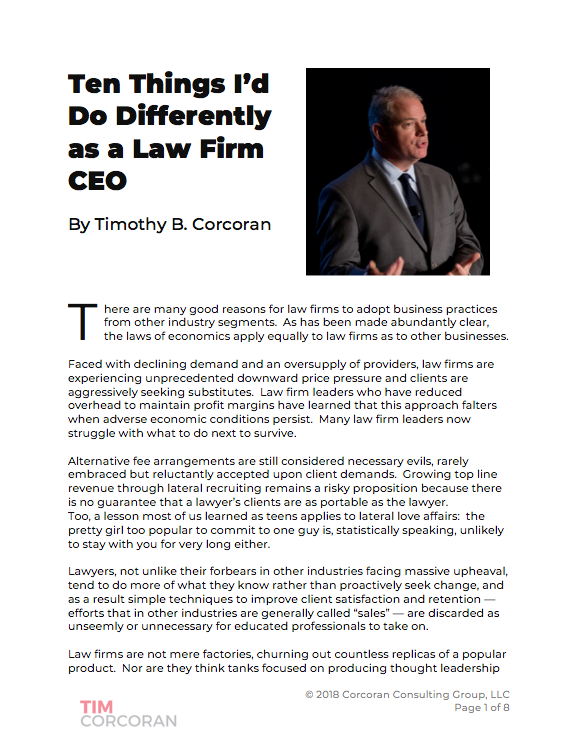 How many law firm leaders believe that ready access to self-help legal tools has eliminated the need for estate, bankruptcy and real estate lawyers? Merely having the tools doesn't confer expertise. This result also occurred when tools for web publishing became more accessible. Recall the endlessly scrolling HTML pages of yesteryear, complete with blinking icons and spinning globes. While both the tools and the professionals using them have improved over time, quite a few law firms continue to waste time and money because they deploy their marketing tools ineffectively. Publishing a website but doing little to drive traffic from qualified buyers is much like printing a pretty, glossy brochure and advising potential clients to visit your office lobby if they want to read it. Many law firm marketers and leaders focus on the design or even the usability of their firm's website, yet ignore the confusing area of search engine optimization (SEO). Even many who invest in SEO efforts do so with the underlying assumption that their targeted buyers rely on the popular search engines to inform their buying decisions... it sounds logical, but is it actually true? But it's not just about websites. It's not too hard to identify the many associations and events populated by target clients. Still, knowing this and actually sending lawyers to these events to participate are two very different things. And this is where legal directories come in. While law firms can do a lot of outbound promotion of their credentials, it's challenging and expensive to attract a lot of quality, and qualified, inbound traffic on a website. Similarly, while law firms can send lawyers to mingle with potential clients, they can't send lawyers everywhere. A sophisticated law firm marketing strategy plan will identify the ideal targets for the firm's offerings. The subsequent tactical plan will outline specific actions to increase visibility with these targets, to demonstrate expertise and to convert targets to clients. Reaching the target audience requires being visible in the places they visit, prominent in the publications they read and, of critical importance, being part of the consideration set when the buyer is ready to buy. Some marketing tools are effective at generating awareness, e.g., advertising, sponsorships. Others are effective at demonstrating expertise, e.g., speaking engagements, articles. Some offer a little of both, e.g., websites. Now let's play this out. We've identified a target market, consisting of potential clients in a specific industry located in multiple jurisdictions globally. We've purchased some search engine keywords to drive traffic to our website, we've secured a speaking engagement for one partner on a panel at a leading industry conference, another partner has been invited to contribute a monthly column in a trade publication, we publish a blog of legislative and regulatory changes impacting this industry, we send several lawyers to various industry association meetings, we advertise in multiple trade publications and we sponsor quite a few industry events. The aggregate cost of these tactics is $250,000 -- assuming our search engine key words aren't in high demand, or the cost could easily reach ten times this amount. And lest we quibble over the amount of this imaginary investment, trust me when I suggest this is a very conservative estimate. Now imagine there's a legal directory that also targets this industry. It offers a monthly e-newsletter containing lawyer-authored articles to thousands of opt-in industry decision influencers and decision makers. A section of the legal directory website is dedicated to showcasing the unique talents of the law firms serving this industry. The legal directory search engine allows industry insiders to research law firms claiming industry expertise, and provides users with quantifiable evidence of expertise to help differentiate from those law firms merely aspiring to enter this market. Imagine that visitors to the legal directory website can click through to the member law firm's own website, and this traffic represents a meaningful portion of overall traffic to the firm's website, with the added bonus that these inbound referrals clearly represent qualified and quality traffic, and not, say, law students trolling for employment opportunities. And don't forget about the legal directory's ranking of law firms specializing in this industry, compiled by editors who conducted independent and objective research. In addition, perhaps the legal directory allows clients to provide commentary about the capabilities and service posture of the law firm, so that other interested buyers can make more informed decisions. And maybe the legal directory forms an alliance with the leading industry association to embed a lawyer search engine on the association website. Perhaps the legal directory offers online discussion forums where lawyers can contribute to substantive discussions in their practice area and engage potential clients in a running dialog. And finally, what if the legal directory can provide statistical evidence that the sum total of its efforts influence buying decisions? Can you quantify the influence that your other marketing activities have on your target clients' buying decisions? There may not be a legal directory that does all of these things, or at least all of these things for all practice areas and industries. But some may provide a host of meaningful opportunities to increase visibility and demonstrate credibility to a targeted market. And that's the whole point. All legal directories aren't created equal, and just because one doesn't suit your firm's needs doesn't mean another won't. To be clear, in some cases there may not be any legal directory that meets your needs. None of the above are unique tactics that a law firm itself couldn't adopt. However, the scale of the investment to replicate the volume and quality of the traffic generated, to reach such a high number of qualified potential targets, and to sustain this visibility and demonstrate this expertise over an extended period of time, will generally cost substantially more than the modest investment above. Imagine if a law firm could obtain access to these benefits by participating in a legal directory for $10,000. Or $50,000. Or maybe it's $150,000. Perhaps it's $250,000. This price may seem high as a single point statistic on an invoice, but is it? The point is, the value of such an investment can be effectively measured only by comparison to the alternatives. If the firm can find a way to reach the target audience in a similarly effective manner at a lower cost, it should run, not walk, to do so. There's no rule that says a law firm should invest in any legal directory, any more than it should invest in a website or in publishing client alerts or printing glossy brochures. It's merely a function of how buying decisions are made with the target market, and what tactics influence buyers and buying decisions. Some firms -- though thankfully fewer than in previous years -- still believe that marketing is about answering the phone in a timely manner. And for some firms, this may be so. For the rest, marketing is about investing thoughtfully in tactics that will provide a return. So what does this mean for the "Martindale question?" The analysis should contain a disciplined approach to weighing alternatives, comparing the costs of reaching targeted buyers through various means. If a law firm leader is convinced that the firm's particular target audience can be delivered without investing in Martindale-Hubbell's legal directory, then this is an easy decision. If the analysis suggests that Martindale-Hubbell can be a multiplier to the firm's own marketing efforts, and through careful negotiations the cost to participate is tolerable, then this is also an easy decision. Likewise, it's okay to opt out simply because you want to save money and since others are doing so it's seems like a safe decision. But let's not pretend it's a rational marketing decision when it's merely cost cutting. It's also okay to invest time and energy in directories that provide little access to clients, but that allow the partners to boast of obtaining a top ranking in their practice category. But again, let's not pretend we're making a rational marketing decision. Many pundits will talk about the scourge of legal directories, or the demise of Martindale-Hubbell in particular. My approach is more circumspect when advising my law firm clients. Such investments are derived from analysis, not hysteria or conventional wisdom. Even we supposed experts should be ignored if we enter the discussion with a pre-formed opinion. I certainly don't feel qualified to advise a law firm leader of the effectiveness of his or her marketing investments until I study what he or she is trying to accomplish and what alternatives are available to achieve these objectives. Some years ago a law firm hired a chief marketing officer from outside the legal profession, and she had no prior knowledge or pre-conceived notion of the effectiveness, or lack thereof, of legal directories. At first she was a client but over time we've become friends. When we first met she relayed that many of her partners and staff encouraged her to drop all directories outright. Instead, she commenced an exercise to analyze the reach and effectiveness of each of the firm's existing legal directories, and invited representatives of other legal directories to provide quantifiable evidence of their product's reach and effectiveness. In the end she canceled many, added a couple, scaled back a few, and augmented some, without regard to internal politics or favorites. She even declined a fully-paid trip to speak at an industry conference, sponsored by one legal directory provider desperate to influence her decision. Her announcement memo to the partners overseeing her analysis was detailed and disciplined and effectively eliminated any arguments, so everyone could go back to work. I recently had coffee with my old friend and I asked her how it all worked out, with several years of history to analyze results. She laughed and said that not every decision has worked out in the long run, but she feels confident that her analysis is as sound as it can be, and certainly more effective than her firm's competition. She's now earned the credibility to act quickly and without onerous committee oversight, so each time one of her major competitors makes a hasty decision to reduce its spending on sponsorships or advertising or directories in areas her firm targets, she tends to increase her investment in order to capture the traffic the competition has given away. This works for her, and though it may not work for the rest of us, how many of us are prepared to submit our decision criteria against hers to justify our marketing decisions? I didn't think so. One final note: the Martindale-Hubbell discussion isn't complete without acknowledging that the organization and the product offering has changed dramatically in recent years. Countless wannabe pundits have concluded that "no one looks for lawyers in books any longer!" as if they're the first to offer this startling revelation. If your analysis of legal directories, whether Martindale or any other, fails to consider the online and in-person components of the value they deliver (or claim to deliver) then your analysis is outdated. (1) Some directories are vanity publications, with no redeeming feature other than the ability for a lawyer to say he or she has achieved some professional distinction, albeit of dubious value. The various state bar associations have started to look more closely at legal directories in an effort to help consumers distinguish between those that provide a valuable service and those that are mere puffery. Not all legal directories can withstand such scrutiny. Sooner or later, every legal marketer is asked to support a lawyer's "nomination" to the "Tall, Blond-Haired, Left-Handed Lawyers of the Upper Midwest" directory. Nothing wrong with a little vanity press for a needy lawyer, but once again it's important to distinguish between such actions and actual strategic marketing. (2) A common objection to participating in a directory is what I call the "mall rebuttal" which is usually some version of "We prefer not to advertise or promote our firm any place that our competitors are doing so." The logic, presumably, is that if we promote ourselves in close proximity to competitors, we risk driving our potential clients to the competition. If this were actually true, then there would be no malls, or shopping centers, or auto dealer supercomplexes. In other words, if you can identify a venue where qualified potential buyers in a buying mode are routinely visiting, why would you reject this venue in favor of a isolated outpost on the edge of town than can only be visited by special arrangement?